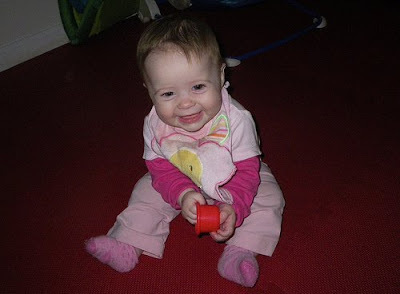 Our Aries baby just began to sit unassisted two weekends ago. Between this latest milestone and starting solids, I am starting to reclaim my body as “mine” again. For me, surviving babyhood is about celebrating these small victories back to the self I once was—BC, before children. * Although I am still young Miss Vivian’s personal milk slave, so we have some distance to travel before I can stop wearing shirts with an eye toward easy access. I find young Miss Vivian to be a focused baby. She sees a toy—usually one with small, removable parts—that she wants and rolls toward it. She grabs her bottle with both hands. In the morning, you better make sure that your coffee cup remains beyond her reach. Young Miss Vivi is the wiley sort of baby who will arch her back and strrrretch in order to gain that extra inch toward the desired item just past the kitchen table’s Forbidden Zone—home to adult beverages and sharp utensils. In fact, we gave up on using the Bumbo seat in favor of the high chair for feeding time. Both of us, parental units, quickly tired of her extending her apple-puree covered limbs and grabbing anything within a five-inch radius of her blue plastic seat. Overall, I would say that Vivian is a pleasant baby. Unlike her brother, she managed to sail through newborn phase without colic. And, I won’t waste more blog space talking about how well she sleeps. Every day we do a little happy dance as we give thanks to the baby sleep gods. Unfortunately, Parental Unit #2 and I are about to enter a new world with Vivian, a world so scary that it makes my miserable pregnancy seem like easy gravy—I am talking about teething. What? I can’t hear you because 1) this is a blog and 2) my shoulders are up to my ears in tense anticipation of the coming dental storm. *as if that is even possible! And unfortunately Mr Danger is still not really sleeping much of the time. 5 inches? maybe only 5 inches laterally, but 18 inches in some directions. and of course we happen to have a high chair ready this time, we were still waiting as long as possible to acquire many things last time due to space concerns, and just plain old lack of time to go get them. Pleasantly Mr Danger moved on to his Junior chair without even missing a beat.